Due to the difference between different monitors, the picture may not reflect the actual color of the item. Color:See picture. If you have any problems, we are very glad to help you. 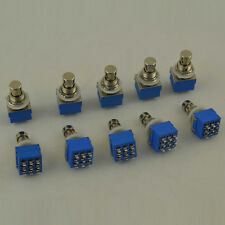 For VHT,BBE,JOYO,Electro-Harmonix Ect Effects Pedal Foot Switch. Hex Nuts,Lock Washer,Flat Washer Inculded. Item: 10PCS A500K Pots. 10 x A 500K Pots. Full size, short split shaft with coarse knurling. Shaft Length: Approx. Whole Length: Approx. Full Resistance: 500K ohm. Missing Order: These 3 situation may occur that: 1. Other alphabets (Cyrillic, Japanese, Chinese, etc.) will not be translated and your item will be delayed. We do not accept wire transfers. Perfect for electric guitar bass upgrade or custom building. Full size, long split shaft with coarse knurling. Color: Gold Color Shaft. Shaft Length: Approx.18mm. Missing Order: These 3 situation may occur that: 1. Bass Push Push Pot x1. Still use Push Pull Pots?. Try to use these Push Push Pots now,One downward touch does it all,no clutching and fumbling forever,there is no need to pull anymore. We promise we will find a more better solution. Same day post if ordered before 2.pm Buy 2, get 1 free. Used to replace the dirty, dingy and old knob. Will fit most electric guitars. Color: as the picture show. This three-way toggle switch can make the gear more clear, extend the service life of the guitar, reduce the output resistance and protect the guitar. 1 3 Way Pickup Selector Switch. Perfect for LP Electric Guitar. 100% Brand new,never used Item's color might be different from the picture because of the aberration Guitar Tone Potentiometer Split shaft with coarse knurling Coarse knurled shaft fits most control knobs B500K-ohm control pot Base Dia:16mm Shaft Length:18mm Split Shaft:6mm Package Include: 10x B500k guitar potentiometers To Fit Guitar Electric Guitar Brand Unbranded UPC 192031029072 MPN N01191 EAN 0192031029072 Classification101 upsku10100268. 2 x TONE KNOBS. They will fit most guitars. El 26-ene-19 a las 09:08:19 H.Esp, el vendedor añadió los siguientes datos. Quantity: 2Pcs. Due to the difference between different monitors, the picture may not reflect the actual color of the item. Color:as picture shown. Flexible commutation. 1x Foot Pedal Switch. Suitable for Electric Guitar. Color: Black, Silver Tone. Soft design. Due to the difference between different monitors, the picture may not reflect the actual color of the item. Suit for LP Electric Guitar. 1 piece LP Guitar Jack Plate. - Material:Zinc alloy. Jack plate Size (L x W):35mm x 35mm. - Color: gold, black, silver. - Has 3 total prongs. 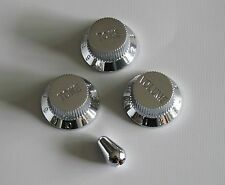 Set of 4 Guitar Knobs Pointer Indicator. Well made quality Knobs Pointer Plate. Defective Order. Quantity: 4pcs. Used to replace the dirty, dingy and old knob. Also note that monitor settings may vary from computer to computer and may distort actual colors. Will fit most electric guitars. Color: Black. Stipulations: A Type(Audio Taper), 450S3468 is A250K. Production Place: CTS Made In Taiwan. Precision Machined Aluminum Shaft With Minimal Shaft Wobble, and Low Noise. Missing Order: These 3 situation may occur that: 1. Full size, short split shaft with coarse knurling. Perfect for electric guitar bass building. Shaft Length: Approx.15mm. Whole Length: Approx. Missing Order: These 3 situation may occur that: 1. you know we will also make mistakes. Features: 100% brand new and high quality Made of superior alloy material, durable and long lasting Works for pots of 6mm in diameter. The perfect accessory for many guitars. Material: Alloy Quantity: 2pc Color: Black Note: Please allow 1-3cm (0.4-1.18") difference due to manual measurement and slight color variation for different display setting. Features: 1.Every product has a unique Manufacturing Part Number label on the inner package that proves it has been qualified,which include Part Number,Model Number and inspection date information; 2.If you have any questions about the item,please provide us the Manufacturing Part Number for checking,your profits will be guaranteed. 3.It is used to replace the old knob 4.It is made of metal material,Durable. 5.It is suit for Guitar Specifications: Material: Metal Color: Black Brand name: Unbranded Size: 1.8x1.9cm/0.71x0.75"(LxOD) Weight: 77 g Package include:. 2 x Tone knobs. Item's color might be different from the picture because of the aberration. Guitar Witch Hat Knobs Gold. Witch Hat Knobs x4. Color: Black with Gold Insert. Excellent Quality at Cheap Price. Great quality Bell knobs for Les Pauls. 4pcs Les Paul Knobs. 4pcs Black/Gold Bell Knobs. Pleas be a little patient for waiting. 10pcs Guitar AMP Effects Pedal Knobs Ivory. 10 Guitar AMP Knobs. Color: Ivory. Pleas be a little patient for waiting. Made of plastic with Set screw. Full size, short split shaft with coarse knurling. Shaft Length: Approx. Whole Length: Approx. Missing Order: These 3 situation may occur that: 1. you know we will also make mistakes. Full Resistance: 250K ohm. Switchcraft Original Output Guitar Jack. High Quality Made In USA Switchcraft Guitar Jack. You are getting one piece. Stipulations: A Type (Audio Taper), 450S3468 is A250K. Precision Machined Aluminum Shaft With Minimal Shaft Wobble, and Low Noise. Shaft Style: Aluminum Split Shaft with Knurling. Whole Shaft Height :Approx. 1x 9-Pin Guitar Effects Stomp Switches. There are a total of nine lugs on each switch,three per pole. For Electro-Harmonix, T Rex,Retro FX, Radial Bigshot,ect effects pedals. Color:Blue & Silver. Hex nuts, lock washer, flat washer inculded. Quantity: 5Pcs. 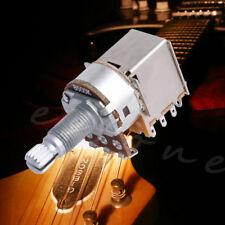 Electric guitar socket jack nuts set, replace your worn out parts. Easy to install, supplied with colour matched washers. 5 x Washers. Suitable for electric guitars and bass. The colors may be a little difference for the different monitor display. 1 x Guitar switch 5 way. Made from high quality material, which is not durable but also stable. Weight: 25g. Product material: pure brass. The picture may not reflect the actual color of the item because of different photographing light, angle and display monitor. Product color: gold. If item is defective after 3 months, you can still send it back to us. Sprague 431P 0.022uf 600DC poly audio capacitors. 1 x Push Button Kill Switch. Should first be grounded and then installed in hot wire to jack. This is our SOP, for us to be certain and for record purposes. Item: 10PCS B250K Pots. 10 x B 250K Guitar Pots. Full size, short split shaft with coarse knurling. Shaft Length: Approx. Whole Length: Approx. Missing Order: These 3 situation may occur that: 1.